In a seven block radius of Old Town Monrovia you will find 72 trash cans. They are conveniently located on each corner, in mid-blocks, at every entry and exit to the public parking lots, behind businesses and next to homes. Yet, somehow, every day, some trash never makes it the last fifteen feet to these containers. All of the trash bins in Old Town are sorted for recycling. By just making it to the trash can, you ensure that your soda can or plastic bag make it back into the economy, not the landfill. It costs money to pick it up. The more time City Staff spends picking up trash, the less time they spend on parks and potholes. Trash on the street is ugly. Monrovia is a proud and beautiful community- let’s not trash it. As economic development picks up and Monrovia becomes an even more popular destination, we will have more traffic and consequently, more trash. How can you help reverse this new trashy trend? Start by making sure all of your trash makes it into the can. If you see trash in the street, pick it up. Let us know how you did! 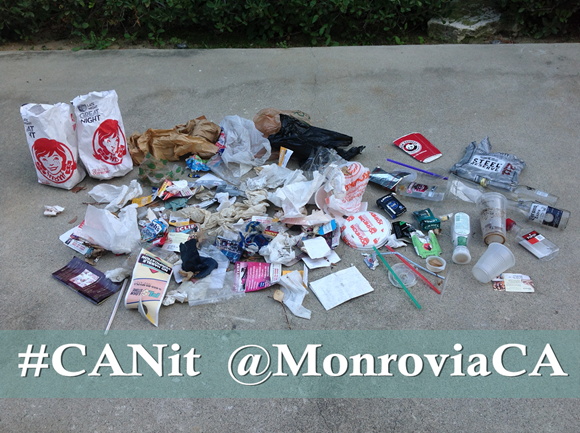 Tag us with #CANit @MonroviaCA. Below is a photo taken by Mayor Pro Tem Shevlin in one parking lot in Old Town. Remember - Put it in the Can. Saturday, August 10, 9:30-3 p.m. MAP Neighborhood Conference IV, Monrovia High School, register here. Construction continues on the grade crossing improvements on California Ave, just north of Duarte Rd. During the past few months, crews have installed new underground and overhead utilities. An existing waterline proved to be a difficult task to upgrade but is now complete. These unexpected conditions have caused the street closure to continue longer than anticipated. Crews have also installed electrical conduits and pole foundations for the new railroad and traffic signals. Soon we will begin building the light rail tracks that cross California Ave, followed by concrete curbs, gutters, pavement, street striping, and finally landscaping. The intersection is anticipated to reopen by the end of September 2013. Please note for three weeks beginning in mid-August, we will be working at the intersection of California Ave and Duarte Rd to complete underground utility work. During the non-peak hours of 9 am to 3 pm, Monday through Saturday, Duarte Rd will be reduced to one lane of traffic for both eastbound and westbound motorists. Flaggers will be present to direct traffic during this time. We appreciate your patience during the construction of this project. If you have questions about the project or construction, please contact one of the representatives listed below. Text GOLDLINENEWS to 888777 to receive alerts to your cell phone. Call the project hotline - (626) 324-7098. During the last seven-day period, the Police Department handled 480 service events, resulting in 84 investigations. To see a complete listing of crimes reported, go to http://www.crimemapping.com/map/ca/monrovia for crime mapping. For Police Department news and information, visit our website and follow us on Twitter for police notifications. While working in the Monrovia Police Department Property and Evidence Room, Property Officer Tom Carroll came across a box of unclaimed property from years past, containing amongst other personal possessions, military medals from the United States Army, including a “Purple Heart” from World War I. The Purple Heart had been awarded retroactively in 1935 to Frank Q. Newton, who had been injured in 1919 while serving on the front lines, nearly 100 years ago. The Purple Heart is the oldest military award still given to members of the United States Military and is awarded to those who have been wounded or killed while serving. Property Officer Tom Carroll, a United States Army veteran and recipient of the Purple Heart himself, immediately recognized the box that contained the medal and felt the importance of reuniting this military decoration with the family of the recipient. Initially, he contacted the Purple Heart Foundation, the repository for information on Purple Heart recipients. Unfortunately, this attempt met with no success, as the foundation has only been in existence for just over fifty years. Tom then began searching law enforcement databases, but again, was unsuccessful. He then sought assistance from the Police Department’s Technology Bureau Supervisor, Jim Emett, who began searching through public genealogical databases for information. He entered the name and army unit of Frank Q. Newton, searching his military records, and eventually was able to positively identify him, which ultimately led to identifying his living relatives. shadow box for the family, and the medals were hand delivered to the family at the Los Angeles International Airport on July 23, 2013. Frank Q. Newton served as a frontline Ambulance Wagoner in the European Theater during the First World War. He was severely injured from exposure to mustard gas while serving on the front lines for the United States Army. He died in 1975 in San Diego, California.